That was never more in evidence than on the chart from this week in 1988, where the two big contenders for the UK Christmas number 1 spot didn't even rate a mention (although they would turn up on the next chart, which covered the two weeks from Boxing Day to January 8). It wasn't all bah humbug, however - the week's highest debut had a festive connection. ﻿﻿﻿Meanwhile, Australia's Christmas number 1 was, as it had been for the previous six weeks, Bobby McFerrin's "Don't Worry Be Happy", but at least this was his seventh and final week on top. Big ballad "Anything For You" had taken the Latin band within a whisker of the top 10, but this party track was inexplicably a major flop locally despite reaching the US top 3. Returning to the ARIA top 100 for the first time since her debut single, this fourth effort from the model-turned-pop star was her second in a row to be produced by the PWL B-team, with Stock Aitken Waterman concerning themselves with more successful artists. One of two songs sharing the SOTW status (we saw the other hit the chart two weeks ago), "Too Young To Despair" was the comeback single - after a four-year absence - for the Aussie rock group who'd been responsible for "Alone With You", "Happy Man" and "You Need A Friend". It wasn't the original line-up of the band, however - they'd broken up in 1984. Instead, it was a new version led by original member Jeremy Oxley. Sunnyboys had never been chart superstars, but the low peak of this single, which was pretty consistent in sound to those earlier songs, must have been a disappointment. Subsequent singles and an album in 1989 did no better. What was happening? Two singles in a row by U2 that I actually liked. After topping the ARIA chart with "Desire", follow-up "Angel Of Harlem" didn't perform as well as I would have expected - but perhaps everyone either had Rattle And Hum or received it for Christmas that year? My enthusiasm for U2 was brief - I wouldn't like another of the band's singles for three years. While the big summer movie in Australia was undoubtedly Cocktail, local film Young Einstein also raked in the bucks at the local box office - although not from me, since it's a movie I've never seen. This cover of the 1957 rock standard by Chuck Berry (which had already been remade by The Beatles and The Beach Boys) was taken from the Yahoo Serious comedy - and there was no better band to contribute to the soundtrack than professional jokesters Mental As Anything. In fact, since "Live It Up" had appeared on the soundtrack to Crocodile Dundee, they seemed to be the go-to band for comedy film songs in this country. Their take on "Rock And Roll Music" was pretty safe - and the broad appeal of the song saw it become one of their biggest hits and their last top 10 hit in Australia. These days, everyone's collaborated with everyone else - twice. But, in the '80s, an all-star duet was a much rarer occurrence - and often fairly random. 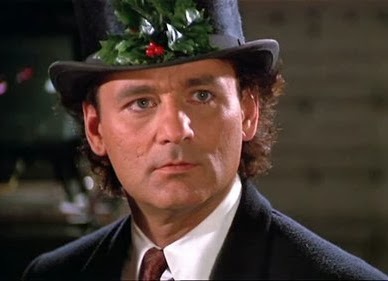 Quite why Eurythmics singer Annie Lennox and soul legend Al Green ended up performing this cover of the 1969 single by Jackie DeShannon for the Bill Murray movie Scrooged, I'm not sure. What I do know is that, on first listen, I quite liked it - however, the more times I heard it, the less I enjoyed it. I don't think either of their voices suit the production and they also don't mesh well together. Throw in the horrible key change and the whole thing's a bit of a shambles. Still, it hit the Australian top 10, giving Annie her first solo success outside Eurythmics and, remarkably, giving Al his first hit in Australia. Yep, despite releasing some of the best soul tracks of the '70s, he'd only ever managed a number 85 placing for "Sha-la-la (Make Me Happy)" before this song came along. Since I have spoken about every single one of those songs on this blog before, there's not much more to say - other than how happy I was that "(I've Had) The Time Of My Life" beat out "Simply Irresistible" to be the year's biggest seller. Next time: ARIA took a two-week break before publishing its next chart, so I'll be back to kick off 1989 on January 8. Before that, though, I'll be counting down my top 100 favourite songs for 2013 between now and New Year's Eve. I love that the Sunnyboys video (I'd never heard the song before) was recorded from Nightshift. I only discovered that show a few months later (shortly before its demise?). I wonder why the 'Rock and Roll Music' video is not on youtube. I doubt it's because of the Young Einstein scenes, as I've uploaded the (admittedly not the best quality) videos for 'Music Goes Round My Head' and 'Dumb Things' which also feature footage from the movie, and they haven't resulted in a copyright strike. I've always assumed 'The Plastic Population' was a pseudonym for Coldcut (referencing the 'plastic man' at the end of 'Doctorin' the House'), given that they produced 'The Only Way Is Up'... although I guess it makes no sense that 'they' were also billed on 'Doctorin' the House' if so. But on some of the 12" singles, DTH was credited to Yazz & The Plastic People, and one remix was credited to 'Plastic Man & The Plastic People'! So presumably The Plastic Population was not her 'band'. 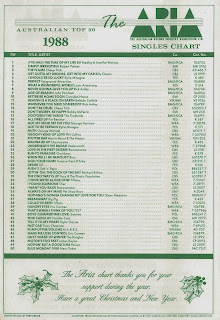 Yazz's 'Fine Time' was listed as a a breaker on one chart I have from 1989, so it presumably charted somewhere in the 50's or 60's, and 'Where Has All the Love Gone?' cracked the AMR top 100. As usual, two of my favourite singles of hers didn't chart so well. I recently learned that Dave Stewart produced 'Put a Little Love In You Heart', so it's slightly puzzling that the duet was credited to Annie Lennox rather than Eurythmics. Unless Dave just didn't want to appear in the video (as with 'Sisters Are Doin' It For Themselves'), or Annie was intending to embark on a 'solo' career at that point. 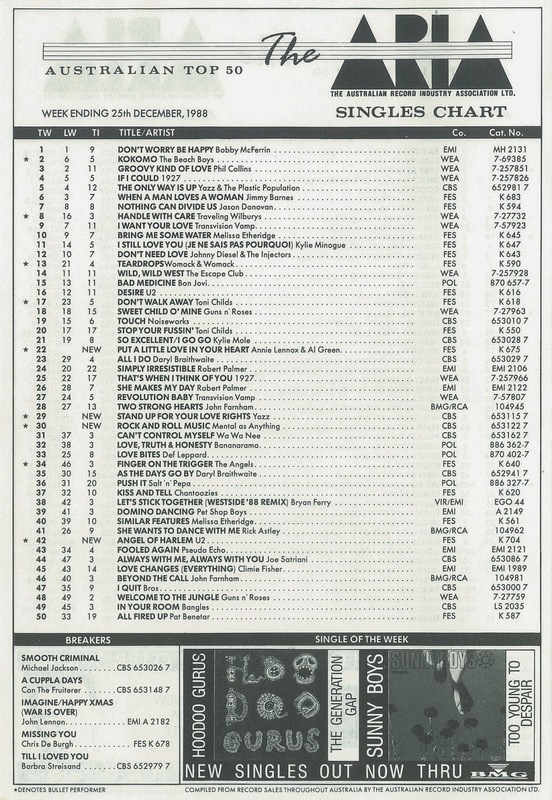 Out of curiosity, was there a printed top 50 ARIA chart for 1987? I've seen the list of songs, but maybe I missed it when trawling back through your blog. 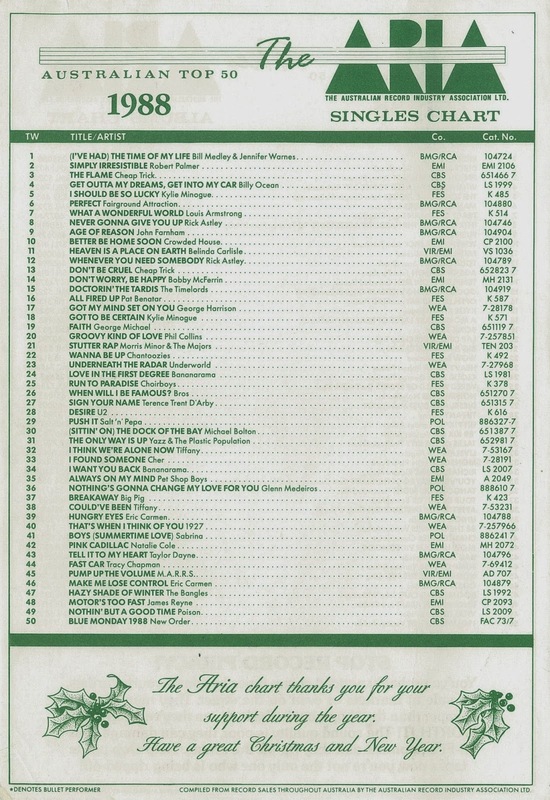 I remember the first annual ARIA chart I picked up (1989's) had a statement from ARIA at the bottom suggesting that you shouldn't buy cheap (bootleg) copies of albums/cassettes from market stalls etc. because, amongst other things, you're being ripped off (as opposed to to the nearly $30 retail price of CD's at the time). I don't know if there was a 1987 end-of-year chart printed. I didn't see it anywhere if there was one, but I may well have missed it. Re Yazz - yes, you're right about those other two singles from Wanted making the top 100 here. This time, I did check my ARIA book, but forgot to check my AMR book for the gaps! I blame the Christmas frenzy for putting me off my game. I just tried uploading the 'Rock and Roll Music' video to youtube, and lo and behold, it's blocked worldwide :(. I hate when that happens; one reason being because you don't find out until after the video has finished uploading - i.e. the waste of time/bandwidth involved in the upload. Grrrrr. Your video may include clips that are owned by a third party. To watch the matched clips please play the video on the right. The video will play from the point where the matched content was identified. Your video is blocked globally. Interesting, but no real loss - it's not one of my favourites! A bit late but Merry Xmas Gavin, hope you have a great festive season. A really interesting list - good to see Climie Fisher and "Man In The Mirror" so high. Thanks for reading! I never knew of a Sunnyboys comeback in 1988? 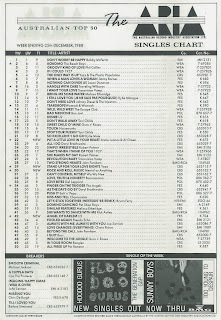 I must have missed this Aria chart, as I did collect them pretty religiously! Maybe Xmas fun and games got in the way. Nathan, Dave did make an appearance in Sisters, he briefly appears solo for the guitar riff in his own little room LoL. I was also happy to see that Simply Irresistible did not make the #1 spot in the end of year charts. That song wore very thin soon after its initial impact. I'd forgotten about the Sunnyboys comeback as well (or never really paid much attention at the time). I knew "Alone With You" but I didn't discover the other two songs I mentioned above until much later.